Since the dawn of the Internet, the demand for good design has continued to skyrocket. From Web 1.0 to Web 2.0 and beyond, designers have remained on their toes as they define the trends and expectations of our online universe. Editor’s Note: You might want to read Nathan Yau’s article The Do’s And Don’ts Of Infographic Design: Revisited here on Smashing Magazine which is a response to this article. Since the dawn of the Internet, the demand for good design has continued to skyrocket. From Web 1.0 to Web 2.0 and beyond, designers have remained on their toes as they define the trends and expectations of our online universe. The Internet is a great designer’s playground, and online businesses are growing more and more appreciative of what can be gained from a bit of well-executed eye candy. Over the past two years, this fact has become the backbone of a growing trend in online marketing: the infographic. Infographics are visual representations of information, or “data viz” as the cool kids call it these days. The term “data viz” comes from “data visualization,” which implies that sets of data will be displayed in a unique way that can be seen, rather than read. This visualization should not be left up to interpretation, it should instead be designed in a way that provides a universal conclusion for all viewers. In the simplest terms, infographics are not too different than the charts and graphs that programs like Excel have been spitting out for years. Of course, just as Web 2.0 changed 1.0, today’s infographics are far more eye-catching than simple pie charts and bar graphs. Today, infographics compile many different data visualizations into one cohesive piece of “eye candy.” They have evolved with design trends, received some creative facelifts, and the Internet is now getting filled with interesting information delivered in enthralling ways. While some design trends come and go, infographics are here to stay. With brands like USA Today, The New York Times and Google and even President Obama getting behind them, infographics are becoming a powerful tool for disseminating huge amounts of information to the masses. Companies large and small are using infographics to build their brands, educate their audience and optimize their search engine ranking through link-building. This is why learning how to design a good infographic is a must, and avoiding the common pitfalls of infographic design could mean the difference between landing a big client and losing them entirely. Designing an infographic is not the same as designing a website, flier, brochure, etc. Even some of the best designers, with portfolios that would make you drool, cannot execute an effective infographic design. Creating infographics is a challenge and requires a mindset that does not come naturally to everyone. But that mindset can be gained through practice and by sticking to certain standards, the most important of which is to respect and understand data viz. Here are some simple rules to follow when wrapping your mind around proper data viz. This Twitter infographic writes out the data, rather than visualizing it. What’s wrong with this infographic? It breaks the first rule right out of the gate. When you have an opportunity to display information visually, take it. 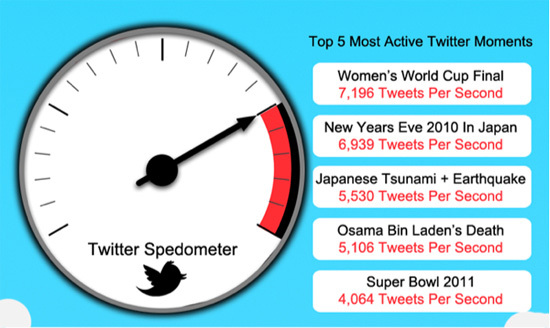 Here, the tweets per second could have at least been shown in a bar graph. This would enable someone to quickly look at this section and see what’s going on; by seeing the various heights of the bars, the eye could have quickly gauged the differences in tweets per second per event without having to read anything. If you’re having trouble adhering to this rule, try keeping all of your text on one layer of your AI file (excluding text inside charts and graphs). Every once in a while, turn off the text layer and see whether the infographic still makes sense. If there isn’t any data viz, or if a bunch of pictures are missing context, then you are doing too much telling and not enough showing. It might sound harsh, but it’s true. If infographics were as simple as laying out a bunch of standard charts and graphs on a page, then clients would not need to search out great designers. Many tools are online that can create colorful pie charts, line graphs and bar graphs, so you have to take things to the next level for your design to stand out. Taking the data from above, which of the two graphs below do you think would make a client happier? Two ways to visualize the data from the Twitter example above. Ways to dress up simple graphs for an infographic. TravelMatch’s infographic highlights too much. Whenever I see this, I’m reminded of the “Where’s the beef?” ad campaign, and I think, “Where’s the data viz?” Although Sketch Rockwell is one of my all-time favorite fonts, this is a perfect example of relying too much on typography. An example of how to visualize the TravelMatch data, rather than relying on typography. All that being said, typography does have its uses, which should not be ignored when creating an infographic. Most of the time, you will want to focus your creative typographical energies on titles and headings. The title of the infographic is a perfect opportunity to use a fun and eye-catching font and to give it a treatment that fits the theme or topic. Just make sure the title isn’t so distracting that it takes away from the reason we are looking at the infographic in the first place. The truth of the matter is that some infographic topics are boring, but the right title design can engage people enough to scroll through. Similarly, headings help to break up an infographic and make the data easier to take in, giving you another chance to let your font-nerd flag fly. The title of an infographic is your chance to draw attention to the design. Organizing an infographic in a way that makes sense and that keeps the viewer interested is not always easy, but it’s part of the job for most infographic designers. Usually, you will be given a lot of data and will need to create a visual story out of it. This can be challenging at first, but you can follow some general rules to make things easier. Wireframing an infographic enables you to work out a storyboard and layout for the design. You may have an idea of the story you want to tell, but as you start laying things out, you might hit a wall and have to start over. Having to reorganize after having already done a lot of the design is incredibly frustrating. Avoid this by setting up your storyline at the start to determine what data to show and how. Set aside an hour to sketch things out and make sure it all makes sense. This will also help to ensure that the color palette you will choose drives attention to the important points and keeps the eye flowing down the page. As you wireframe the infographic, you will identify section breaks that help to tell the story. Most infographics online have a vertical flow, in which each section has a heading to distinguish it from the last. This gets boring fast. Organizing the data and sectioning off information without relying entirely on headings and color breaks is a good way to break the monotony. 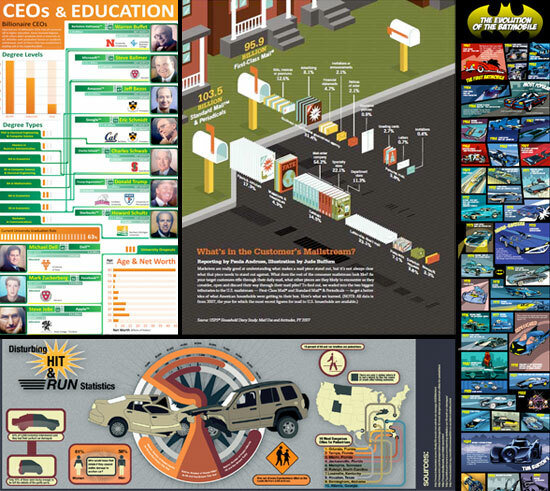 There are many unique ways to lay out an infographic that will keep the viewer engaged. All good stories have a beginning, middle and end. Infographics deserve the same treatment. At the beginning of the infographic, introduce the problem or thesis. From there, back it up with data. Finally, end the infographic with a conclusion. 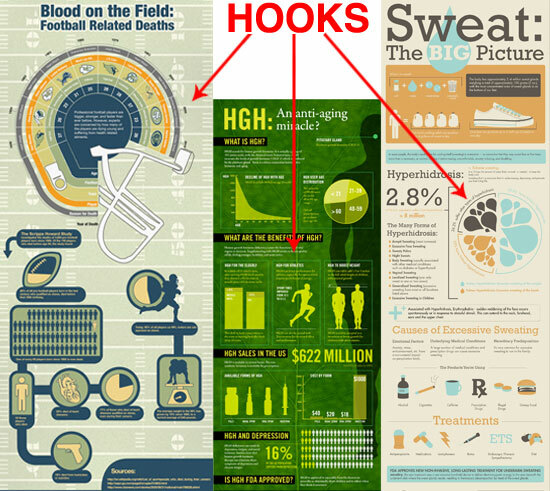 Hooks should either be in the center, beginning, or end of the infographic and need the greatest visual emphasis. The difference a color palette can make is amazing, especially in the world of infographics. The right palette can help organize an infographic, evangelize the brand, reinforce the topic and more. The wrong palette can turn a great topic into an eyesore, harm the brand’s image and convey the wrong message. 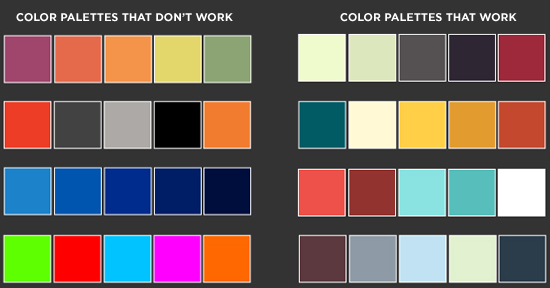 Here are some tips to consider when choosing colors for your infographic. In Web design, it’s always important to choose a palette that fits the theme of the website and that is neutral enough for a diverse group of visitors. Because infographics are primarily shared online, picking the right palette for an array of visitors is equally important. You must also consider what looks good online. For instance, dominant dark colors and neons typically do not translate well on infographics; neon on black can be hard to read, and if there is a lot of data, taking it all in will be a challenge. Also, avoid white as a background whenever possible. Infographics are often shared on multiple websites and blogs, most of which have white backgrounds. If your infographic’s background is also white, then deciphering where it begins and ends will be difficult. With all of the data that goes into an infographic, make sure that the reader’s eye easily flows down the page; the wrong color palette can be a big barrier to this. Choose a palette that doesn’t attack the senses. And consider doing this before you start designing, because it will help you determine how to visualize the various elements. If picking a color palette is hard for you, stick to the rule of three. Choose three primary colors. Of the three, one should be the background color (usually the lightest of the three), and the other two should break up the sections. If you need to add other colors, use shades of the three main colors. This will keep the palette cohesive and calming, rather than jarring. When picking colors, you don’t have to reinvent the wheel. A number of great websites out there will help you choose the right palette for your infographic. Adobe’s Kuler offers fresh themes and a searchable database, as well as an easy tool to adjust the palette that you’re interested in. One issue with Kuler is that all of the palettes have five colors, and the colors are sometimes from completely different families, rather than shades of a few primary colors, so finding the right palette can be like searching for a needle in a haystack. While these standards are important to consider for most infographic designs, sometimes an infographic comes along that breaks all of these rules and still succeeds immensely. In the end, clients like “eye candy” and designs that “pop!” While such terms are subjective (and annoying to most designers), we all know a great infographic design when we see one, and your clients do, too. Use these rules to guide you into the infographic realm, but create your own techniques and standards after you’ve gained some experience.